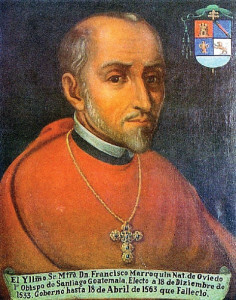 Francisco Marroquín (1499-1563) was the first bishop of Guatemala and the country’s first linguist. Born near Santander, Spain, he studied philosophy and theology and was a professor at the University of Osma. He became a Dominican priest and was at the Spanish royal court where conqueror Pedro de Alvarado met him in 1528 and persuaded him to come to Guatemala. In 1530, Marroquín was appointed parish priest in Santiago de Guatemala (the second capital) and made bishop in 1534. He founded a school for the Spaniards’ children and later presided over the move from the flooded capital (1541) to what is now La Antigua Guatemala. Bishop Marroquín was truly a leader in forging the new capital in the 1540s. 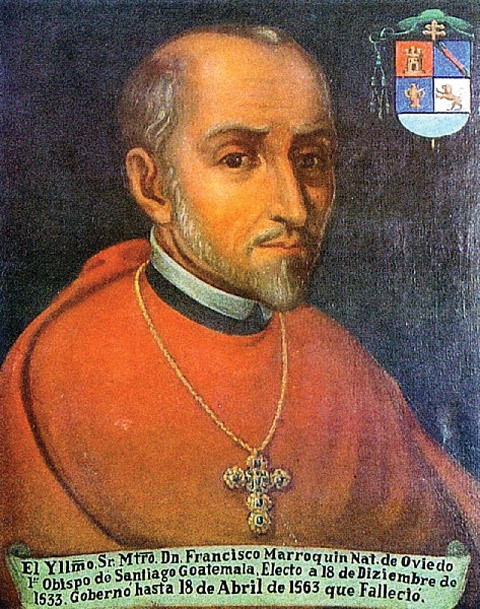 He founded the Hospital Real de Santiago in 1541 and was also responsible for building the first cathedral (1543). He was also well known for his efforts to educate the local Maya, becoming a scholar of the K’iche’ language and published the first catechism in that language in Mexico and later in Kakchikel (the printing press arrived in Guatemala in 1660). Marroquín was a great friend of Bartolomé de las Casas (Bishop of Chiapas), who campaigned to enforce the Laws of the Indies which helped the Mayas to be declared human in Burgos in 1542, leading to their “freedom” from slavery. Marroquín moved from the Bishop’s Palace on the Central Park in Santiago (La Antigua) to San Juan del Obispo where he enjoyed a magnificent view of the city. The current palace post-dates Marroquín’s life and was restored by Archbishop Mariano Rossell y Arellano in the 1950s and has been administered by the Bethania nuns since 1972. A museum within the palace was created by the G&T Foundation in 2006 and is well worth a visit. The church alongside the palace is one of the best examples of colonial architecture in Guatemala and the colonial art inside is fabulous—a must for all colonial art studies. Bishop Marroquín also left his inheritance to found the Colegio de Santo Tomás in 1620 (located next to the Santo Domingo Church), which later became the University of San Carlos de Guatemala in the new capital. The university is now a thriving institution in Guatemala City. 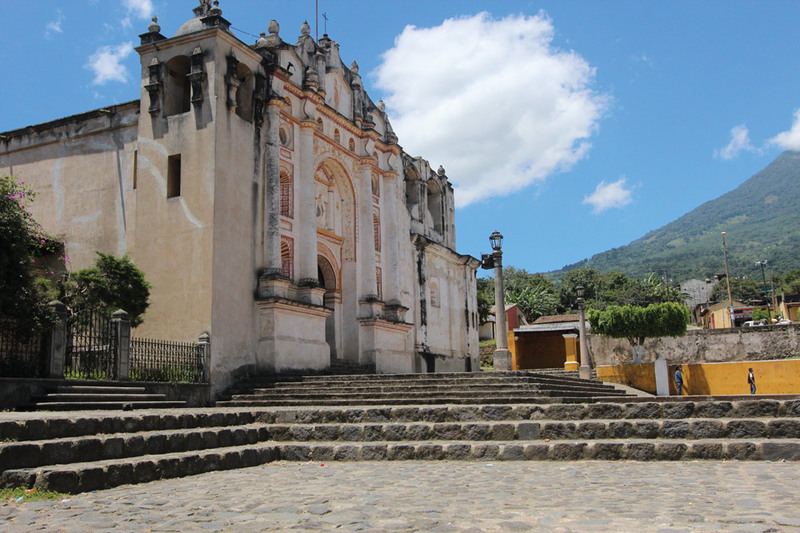 It is believed that the remains of our famous bishop were buried under the main altar at the cathedral in La Antigua. Excavations carried out in 1944 could not confirm this. The remains—with other famous historical figures—were deposited in a box at the local courthouse and then tampered with over a 40-year period. While working at the Consejo Nacional para la Protección de Antigua Guatemala in the early 1980s, we rediscovered the box and were fortunate to have the three Guatemalan gentlemen who carried out the excavations still alive at that time. We ceremoniously opened the box, and they all immediately said, “Oh, no. These are not the human remains we put in the box in the 1940s.” It appears that the remains had been substituted for animal bones over the years! While the plaque at the cathedral still bears Marroquin’s name, his remains are lost to the ages.